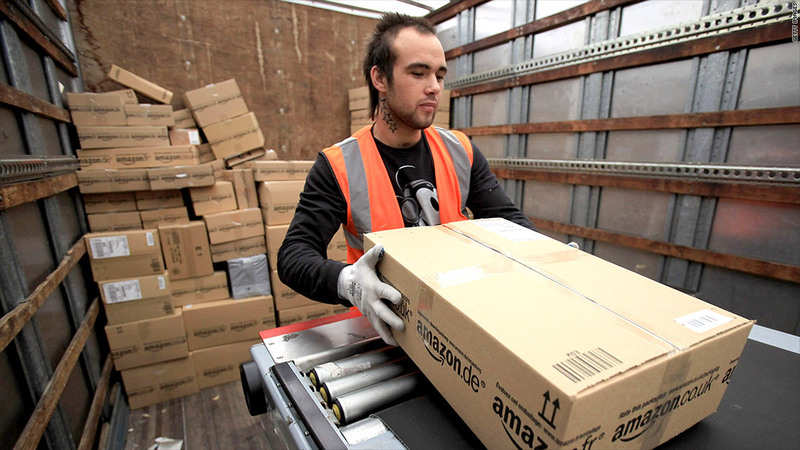 Amazon currently employs 20,000 people at its 40 fulfillment centers across the country. Amazon (AMZN) currently employs 20,000 people at its 40 fulfillment centers across the country, where the seasonal employees will be placed. The company said it expects thousands of seasonal workers to stay at Amazon in full-time positions after the holidays are over. Amazon didn't specify the types of positions for which it's hiring, but workers at the fulfillment centers typically perform a range of tasks involved in online orders: Pulling items from warehouse shelves, packing up boxes for shipment and storing incoming merchandise. It's just one of several big seasonal hiring announcements recently. Outplacement firm Challenger, Gray & Christmas reported that as of last week, U.S. retailers -- including restaurants -- have so far announced plans to hire 413,700 seasonal workers. That's a five-year high for seasonal hiring. Macy's (M), which also owns Bloomingdale's department stores, plans to bring on 80,000 temporary workers. The retailer said it will need the extra workers to staff its sales floors, store operations and call centers, as well as shipping centers for online orders. Toys R Us said last month that it will hire 45,000 seasonal workers, an increase of 5,000 compared to last year. Department store chain Kohl's (KSS) also announced last month that it will hire 52,700 seasonal workers, which is a 10% jump compared to the prior year. The stores are all hoping to take advantage of a holiday sales season that's expected to be strong. Earlier this month, the National Retail Federation predicted that the season's sales will increase 4.1% from last year, to $586 billion. Holiday sales rose 5.6% last year, and have risen 3.5% on average over the past decade, the NRF said. The industry group defines "holiday sales" as retail industry sales in November and December excluding car dealers, gas stations and restaurants.